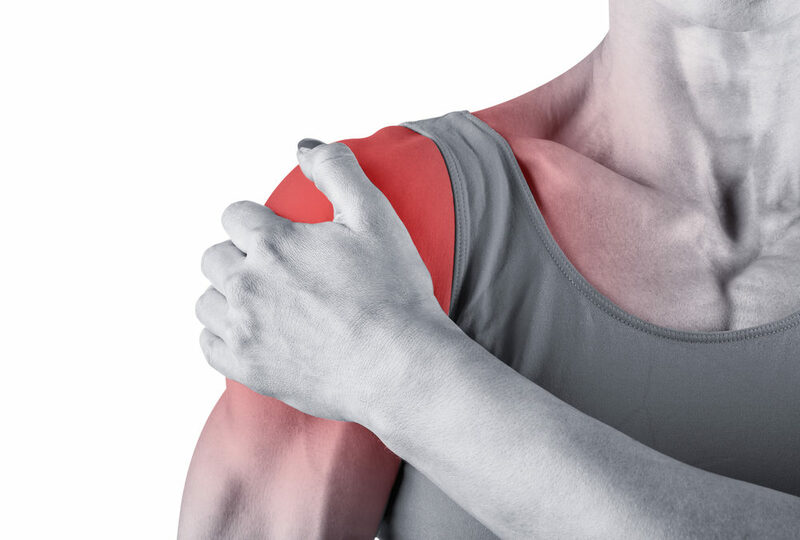 The shoulder is a common area that is prone to injury due to the makeup of the freely movable joint which provides excessive ROM. There are many ways that you could injure your shoulder; any repetitive overhead arm use or unsupported reaching, such as painting, throwing, or even lifting objects out in front of your body, and shoveling snow. Sports have a huge impact on the shoulder and could cause shoulder pain due to the repetitive motions during practices and games. If there are muscular imbalances or fixations in the muscles that surround the shoulder and shoulder blade, you have a higher likelihood of an overuse injury. Athletes are also at a higher risk of direct impact to the shoulder when playing sports. The shoulder has a smaller number and size of muscles that surround it compared to the hip joint. It is surrounded by the 4 rotator cuff muscles that form a cuff around the humerus (the bone in the upper arm) and work in combination with the scapula (shoulder blade) to move and lift your arm. It is made up of the supraspinatus, infraspinatus, teres minor, and subscapularis, with the supraspinatus tendon being the most commonly injured or torn. There are also many bursa (fluid-filled sacs) in your shoulder that protect the tendons and other soft tissue from rubbing on the bone or over each other which could cause inflammation and shoulder pain as well. The muscles in your arms and shoulders are also supplied by the nerves that exit the spinal cord through your neck. Therefore, if you have impingement or dysfunction in your neck and upper back, it could be causing shoulder/arm pain, achiness, or weakness. When students are on their phones, studying, or on computers for long periods of time, it can put stress and strain on their neck, upper back, and shoulders causing pain and stiffness. As sports chiropractic specialists, we not only realign your spine and clear irritation on the nervous system, we also have many different soft tissue tools and therapeutic techniques to get you “back in the game.” At Pro Chiropractic, we have techniques such as Graston Technique (instrument-assisted soft tissue mobilization), myofascial release, and Pulse Wave Therapy (a.k.a. pressure or shock-wave therapy) that break up adhesions that form in the muscular tissue from sports or overuse injuries. Modalities such as ultrasound, electrical muscle stimulation, cold laser therapy, and dry needling help to activate the healing process at a cellular level and decrease inflammation. Other modalities including cupping and kinesiology tape can be used to lift the tissue and stimulate blood flow and accelerate healing into the affected areas. Proper alignment of the glenohumeral joint is important in order for the bones to glide smoothly when using your arm and shoulder. One thing that most people do not realize is the importance of the mobility of the shoulder blade. If it is fixated or lacks proper ROM, it can put stress on the rotator cuff muscles and the overall function and mobility of the humerus and shoulder. It is important to clear the shoulder blade of adhesions and check/adjust the mid and upper back, so the spine and ribs are able to articulate smoothly and take excessive pressure off the shoulder and rotator cuff muscles. Another great advantage of seeing the doctors at Pro Chiropractic is that if our patients need more stabilization and strengthening in their shoulder, we can walk them over to our physical therapy partners Pro Physio for a well-rounded treatment approach. Our patients are able to receive the optimal care and rehab they need without having to drive to a whole new location. This blog post was written by Dr. Jenny Noordmans.